If you tuned in last time, you saw my review of Tree House Julius: a stellar, juicy IPA that has become Tree House's most notorious beer. Today's beer is actually a spin on the Julius recipe. 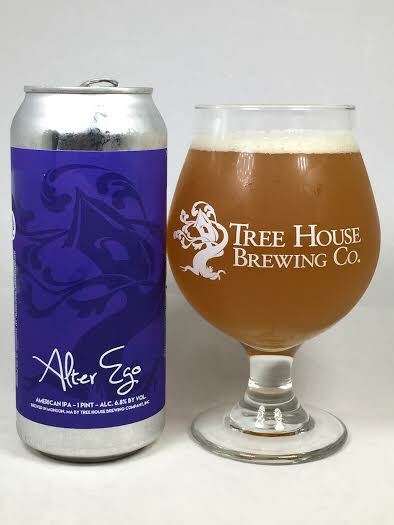 Alter Ego retains the same exact base beer of Julius, but with this brew, they added Mosaic and Amarillo hops to the dry hop to create an entirely new experience for the senses. Pours a dirty, hazy dark orange with a finger's worth of white head. Heavy pine presence on the nose with black pepper, dankness, and bitter, grassy hops. The elements of the base beer are still coming through loud and clear with sweet juice extract and grapefruit on the taste. The new dry-hopping is throwing in some piney sap and cedar with black pepper. It's noticeably more dank and grassy on the taste rather than the dominant fruit of regular Julius, but it's still a delicious experience. Some biscuity malt is noticeable too which adds a dryer note to the beer. The mouthfeel is soft and pillowy. I do feel like this is slightly dryer than regular Julius even though the base is supposed to be the same. Whereas Julius has some lingering hop oils on the finish, this beer leaves behind bitter grass and earthy notes with just enough juice to make it refreshing. Alter Ego definitely adds a nice kick of dankness to a juicy base beer. The original Julius is still present with everything sweet, but the new dry-hopping contributes the bitterness to go along with it. If you want the juice bomb, you stick with Julius, but for those who desire the dank, grassy, piney kick to their IPA's, then Alter Ego is worth checking out.